Silvergate Bank, one of the few U.S. financial institutions that actively serve cryptocurrency businesses, added 59 such clients in the fourth quarter, but its deposits from the industry shrank 8 percent. According to an updated IPO prospectus filed with the Securities and Exchange Commission, as of Dec. 31, the San Diego-based bank had 542 clients in the industry, including crypto exchanges, institutional investors in digital assets, and others. That’s up from the 483 crypto clients as of Sept. 30 that Silvergate counted when it first filed to go public last year. Among the new crypto clients signed in Q4 were two exchanges, 24 investors and 33 firms in a miscellaneous category that includes blockchain protocol developers, miners and service providers, according to the updated prospectus. For the first time in an SEC filing, Silvergate identified some of these clients, a few of which were previously not publicly known to be bank customers: market maker Genesis Trading and investment funds Kenetic and Polychain Capital. Earlier published reports have noted that the bank worked with bitcoin wallet provider Xapo, diversified crypto startups Paxos and Circle, and exchanges Gemini, bitFlyer, Kraken, Coinbase, Bitstamp and Bittrex. Despite the growth in crypto clientele, the amount of U.S. dollars these customers held in their Silvergate accounts declined by $123 million in the fourth quarter, from $1.593 billion on Sept. 30 to $1.470 billion on Dec. 30. This shrinkage came entirely from the exchange category, where account balances declined by $174.4 million, to $618.5 million. while deposits from the other two groups grew. Crypto investors’ deposits increased $4.8 million to $577.5 million and other startups’ balances grew $46.4 million, to $273.9 million. Crypto-related businesses not only make up the main customer base of Silvergate but also own 13.1 percent of the bank’s stock. 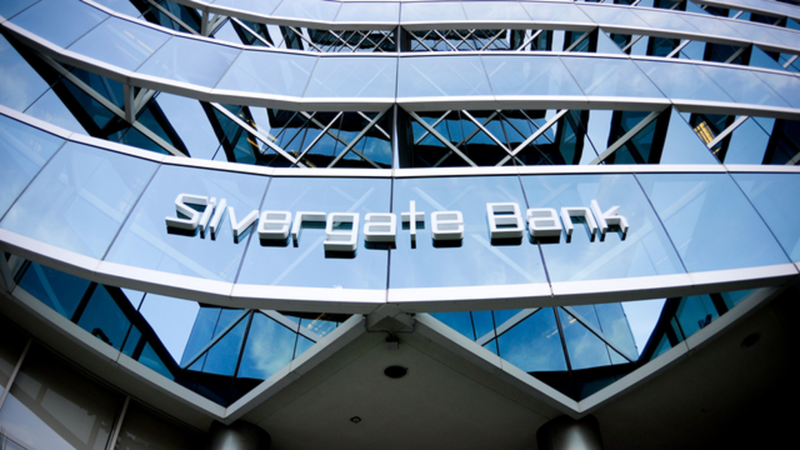 Silvergate’s 10 largest clients had $843.6 million of deposits at the bank – roughly 47.3 percent of the total – and nine of them are crypto businesses, the latest filing said. Further, the 37 cryptocurrency exchanges using Silvergate account for 34.7 percent of its total deposits. For the full year, Silvergate noted, deposits from digital currency clients increased $150.4 million, or about 11.4 percent – even as the price of bitcoin crumbled from over $13,000 to less than $4,000 over the same period, suggesting that the bear market didn’t impede this bank’s growth in 2018 as a whole.